I love my Paneer Tikka.Most of the times,it features on my order list when we dine out and by my own judgement,if the Paneer tikka is good,the main course would be awesome too.Recently,we had it at Dhabba Express,Cenotaph road and were licking our fingers,it was that good. I wanted to recreate it at home one day for lunch but I had not marinated the ingredients ahead in time.So did a twist there and made this well recommended Paneer Tikka Masala from Vahrevah.The recipe is very simple to put together and works well even if you are in a hurry.I had prepared Jeera Rice and Raita and this made for a Jhakaas combo. Mix together the ingredients for the marinade,starting with curd,chilly powder,kasoori methi,salt,lime juice and oil. Tip in the cut vegetables and mix well,keep this aside to marinate for 15 minutes or so till you prepare the gravy for the curry. In a kadai add oil and crackle cumin seeds.Tip in the chopped onions and saute till they start turning golden.Add a pinch of turmeric and ginger garlic paste. Add maida and keep stirring.Cook it for 3-5 minutes till the raw smell of maida and ginger garlic paste disappears. Simultaneously,in a flat tawa add a tsp of oil and saute the marinated vegetables till they get cooked and browned evenly on both sides. Add tomato puree to the sauteed onions and mix well.Mix in coriander powder,cumin powder,garam masala and saute till you see oil floating on top.Add water and let the whole thing come to a boil.Simmer for a while,about 5 minutes. 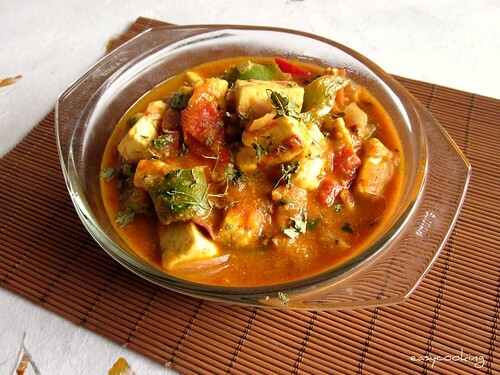 Add the roasted vegetables and paneer to the boiling gravy and mix well.Check seasoning.Cook for 5-7 minutes and garnish with freshly chopped coriander leaves. Well made paneer tikka is not something you get everywhere,dry and rubbery paneer is such a put-off! This looks good. I love any dish with paneer. I love the way you have described the combo, "jhakaas". 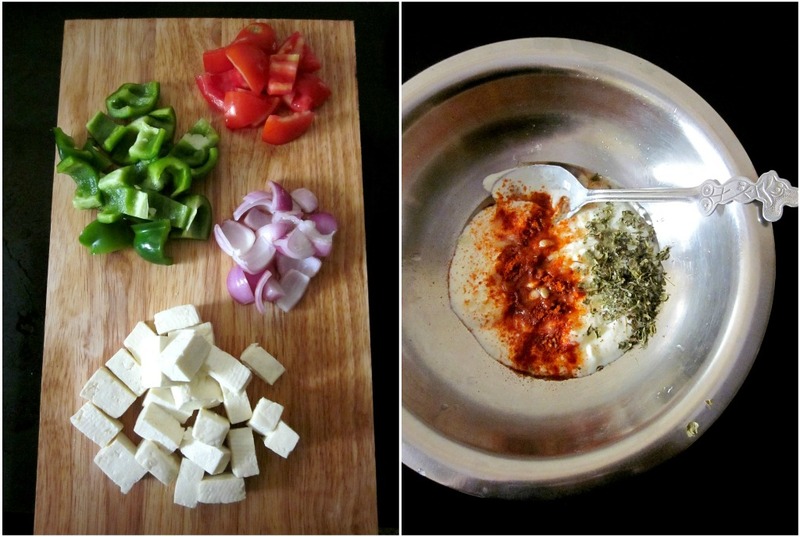 Paneer tikka masala looks really inviting. Great recipe, one of my fav dishes. Is this out of your new kitchen?? Paneer tikka masala and jeera rice must have made a delicious combo! Love the first pic.. 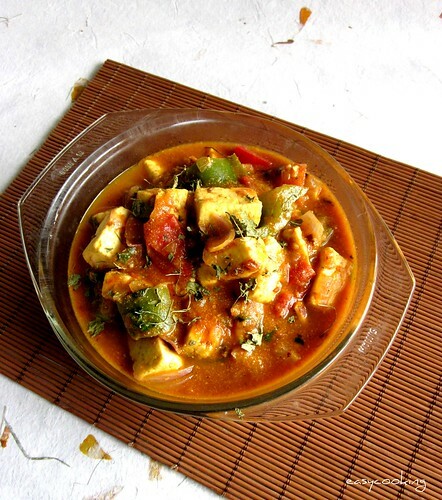 I love any dish with paneer,tempting masala. 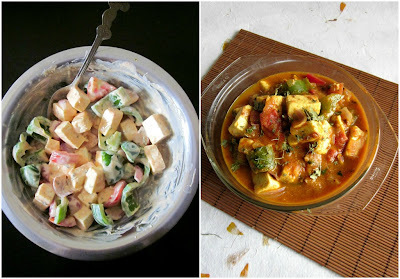 Hi Divya,thanks for the recipe. i tried it yesterday and it was perfect with ghee rice. I want. I want. Can I have some?